Also known Power Man, Luke Cage possesses superhuman strength and unbreakable skin, making this Marvel superhero a formidable force to be reckoned with as he fights villainous criminals. Bullets cannot phase him, and he defeats most opponents with ease. First debuting in 1972, Luke Cage is the main character of a 2016 Marvel Cinematic Universe series where he fights against corruption as he rebuilds his life in Harlem, New York. 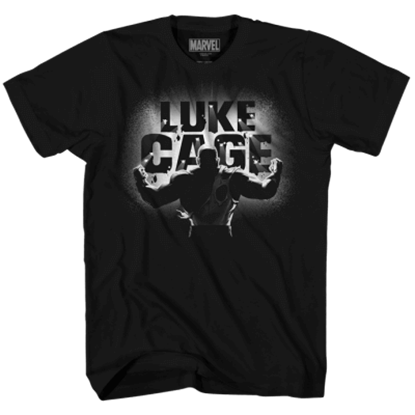 Fans of this nearly indestructible superhero will find a plethora of products celebrating Luke Cage here at Superheroes Direct. Check out our selection of apparel, collectibles, licensed merchandise, and more, all inspired by this powerful superhero and the comics and shows he appears in. Although a barrage of bullets has ripped through a wall and tattered his clothing, our superhero remains tall, his fists upraised in defiance. As seen in the Untouchable Luke Cage T-Shirt, no amount of gunfire will take him down.